Back when I started this challenge, never in a thousand years did I think that Latvia would be in the last 5 beers in the challenge! Latvia is admittedly a small country, with a population of around 2 million, but they all drink beer! And lots of it! To put it in perspective Aldaris Brewery alone made over 100 million litres of beer in 2007! Production has increased even more since the takeover of the brewery by Carlsberg in 2008, however the figures are swallowed up by the global numbers Carlsberg put out. Gaisais mean light beer in Latvian and most of the big breweries have a Gaisais and a Tamsais (dark beer). Aldaris is the biggest producer of beer in Latvia so I'm putting it through it's paces for you. Remember that I will hopefully be able to re-photograph this when I'm home in about a week so the appearance may change. However, Aldaris Gaisais pours almost perfectly for a Euro Pale Lager. The beer is a beautiful golden straw colour and has a large white bubbly head. There is a good amount of carbonation rising to maintain this head and this contributes to this beer leaving excellent lacing. The nose has some positive and some negative aspects, however the positives outweigh the negatives in this case. Hops are quite noticeable on the nose and they have citrus and grassy characteristics. The malt base seems clean at first but as the beer warmed it began to smell like a skunked beer. If you drink this beer very quickly, you will not encounter this problem. I would say that Aldaris Gaisais just about breaks even on points for the nose. I can report that the skunky aroma does not translate over to the taste. 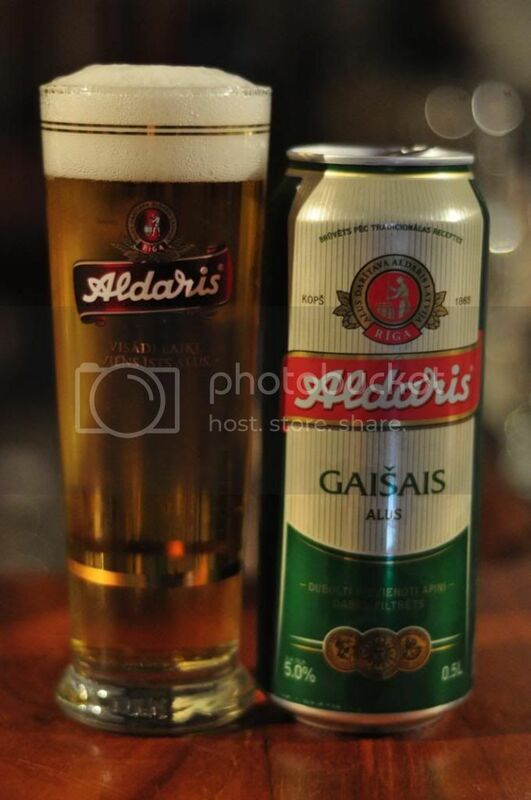 Aldaris Gaisais is a fresh tasting lager which may be a tad sweet for some. It has just about enough grassy hops to balance the beer but it's borderline and as the beer warms you lose some of this bitterness and it becomes more difficult to drink. In saying that, if you drink it quickly in the sunshine in Riga it's a very refreshing beer! Aldaris Gaisais is a really solid lager and one I would happily recommend to friends visiting Latvia (because as hard as you try you can't get it in Australia!). Is it a beer I'd go out of my way to get again? Probably not, but it's certainly a serviceable lager that is versatile, it goes well on it's own & with food & as a session beer. If you are a macro lager fan it would be worth giving it a go, just go in with low expectations and you should be pleasantly surprised.